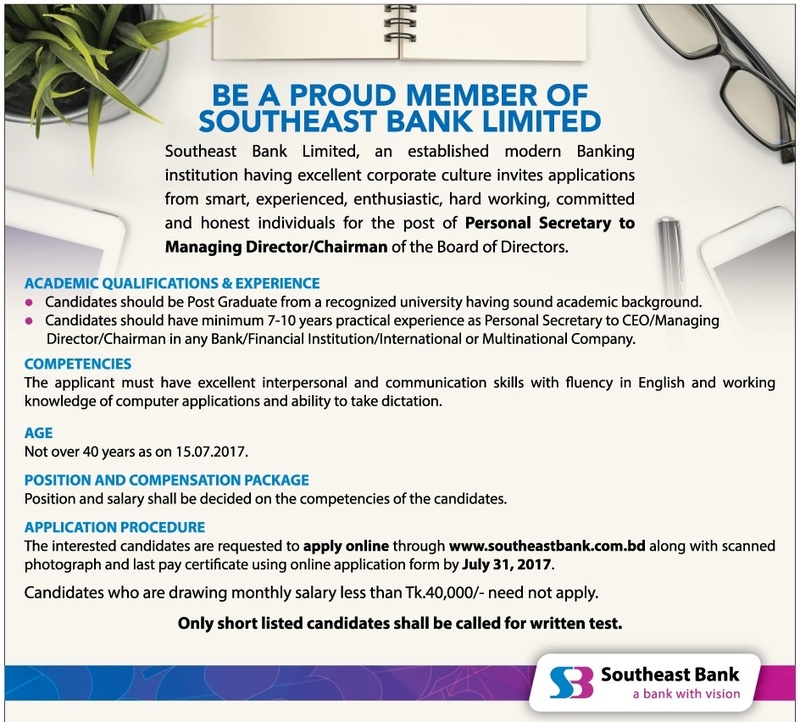 Career Opportunity at South East Bank Ltd.
Career Opportunity at South East Bank for the post of Personal Secretary to Managing Director/Chairman of the Board of Directors. Interested and qualified candidates are requested to apply online. South east bank is one of the leading banks in Bangladesh. It provides great opportunity for job seekers to be proud member of the bank. Some general information regarding the job are given below. Name of the organization: South East Bank Ltd. Applicants should have post graduate degree from reputed university with good academic background. Applicants should have 7-10 years practical experience as personal secretary to CEO/Managing director / Chairman in any bank. For more relevant information see image below. Competency: The applicant must have excellent interpersonal and communication skill along with fluency in English and also working knowledge of basic computer application and ability and mentality to take direction. Position and Compensation: Position and salary shall be decided on the competencies of the candidates. Salary condition: Candidates who are drawing monthly salary less than 40,000/- TK need not to apply. Interested applicants can apply online through https://www.southeastbank.com.bd/career.php. Only shortlisted candidates shell be called for written and further test.